Set against the backdrop of the Kansas-Nebraska Act and the debate over whether Kansas would enter the Union as a free or slave state, the territory’s election of March 1855 is notorious for the fraudulent voting and violent intimidation that took place at the polls. It resulted in the election of overwhelmingly proslavery representatives who formed a territorial government at Lecompton, considered by its antislavery opponents to be an illegitimate "Bogus Legislature." This broadside makes it clear that before a single ballot was cast, both sides were already hotly contesting the rules governing the election. The stakes were high, as the national parity of slave states and free states hung in the balance. 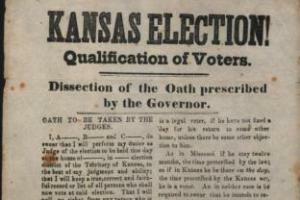 The core dispute concerned the eligibility of voters who lived in the slaveholding state of Missouri, who feared a third free state and safe haven for escaped slaves on Missouri’s borders, and who would soon cross the border to cast ballots in Kansas Territory. 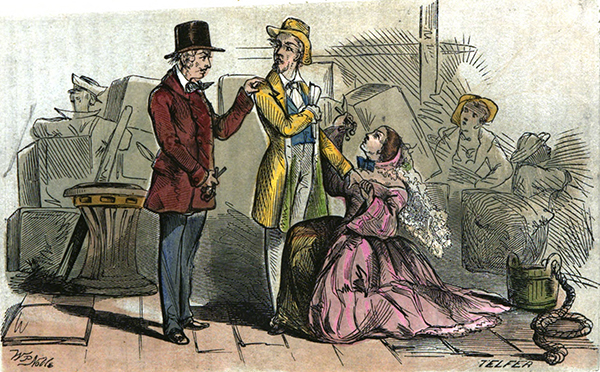 By law, voters had to be inhabitants of the new territory to vote in its election. The territorial governor, Andrew H. Reeder, issued an oath to be taken by election judges, requiring them to swear that they would "poll no ticket from any person who is not an actual inhabitant and resident of said Territory on the day of the election," and that they would "reject the [votes] of all non-residents, who I shall believe have come into the Territory for the same purpose of voting." The broadside in question came from the proslavery side, which argued in advance of the election that Missourians should be allowed to vote in Kansas elections. First, the broadside argued that there were no property qualifications—such as a "house, dwelling, or residence"—to establish that a voter was an inhabitant of the territory. Instead, the broadside held that they would only need to live there as long as the legal requirement to establish residency, and it claimed that the Kansas-Nebraska Act did not specify a minimum length of time for this requirement; it only required that voters not have any definite plans to move from the state. Hence, the broadside claimed that "every man in the Territory on the day of the election is a legal voter, if he have not fixed a day for his return to some other home ..."
The second argument made in the broadside is that Missourians would have the right to enter Kansas for any purpose, and they should not be disqualified from voting just because their purpose was voting. Third, the broadside argued that no proof was required to establish residency because there was no time limit specified: "if a party be in the Territory on the day of the election the judge is bound to believe him a voter ... So in Kansas, where he is only required to be living in the Territory on the day of the election, his being there on that day is all the proof that is necessary." The broadside document presaged what would happen on March 30, 1855, as thousands of Missourians poured over the border to vote in the Kansas elections. Under the leadership of U.S. Senator David Rice Atchison and others, these "border ruffians," as they became known, threatened election judges with injury or even death, intimidated voters, and stuffed ballot boxes. The town of Leavenworth recorded five times as many votes as its entire population, and 90 percent of the votes supported proslavery candidates despite wide acknowledgement that antislavery residents living in Kansas outnumbered their proslavery counterparts. Free-Staters denounced the newly elected representatives as the "Bogus Legislature," and the dispute escalated in the U.S. Congress, as Republicans and Democrats split over whether to acknowledge the legislature as legitimate. Free-Staters set up their own government at Topeka, which was soon condemned as treasonous by President Franklin Pierce. The Free-Staters’ own governor, Charles Robinson, was accordingly arrested at Lexington, Missouri, and charged with treason before being acquitted a year later. Tensions along the Missouri-Kansas border culminated in the violence of "Bleeding Kansas," which both sides carried out with equal ferocity, and the national divisions represented by the border war ultimately intensified into the American Civil War.